This is a fun and simple way to add some dynamics to your lithopane projects. 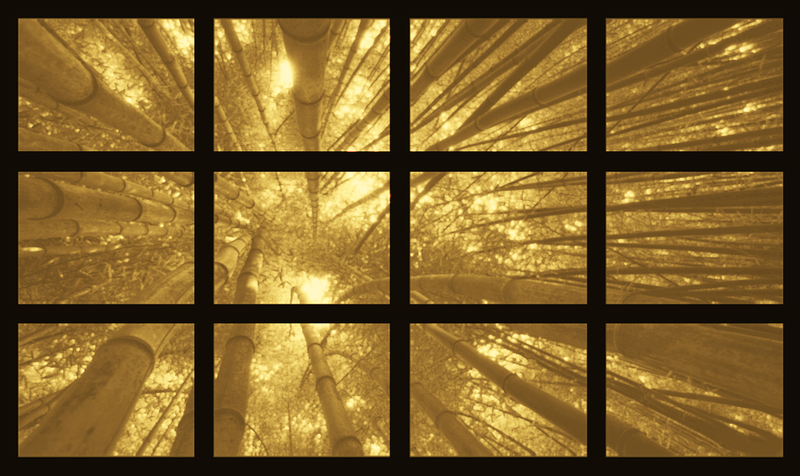 We will split our chosen photograph into multiple tiled pieces and carve them individually. These pieces can then be reassembled into one larger image and displayed. Find a the photo you wish to carve. There are many sources for images if you don’t have one of your own. I found this image through a Bing images search. I use the Filters to search only large images under the creative commons license. This ensures the image will have enough resolution to be reproduced and I can legally do so. Once you have selected your image, click on it to view the source image and download it. I found a website that splits the image into as many tiles as you like. ( imagesplitter.net ) The site is really easy to use. Upload your image and then specify how many rows and columns you wish. When is is set, click the spit image button, and it will download a zip file with all the images. 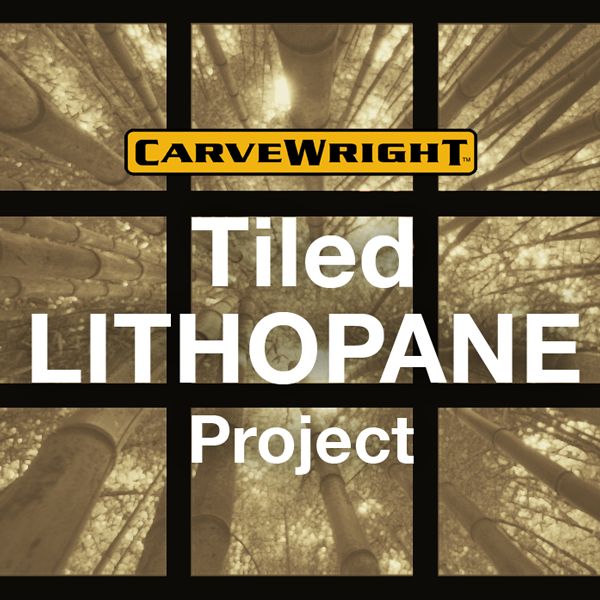 Import each image into the CarveWright Project Designer Software. The importer is found under File/Import/Import Image. Save each image into your Favorites folder. 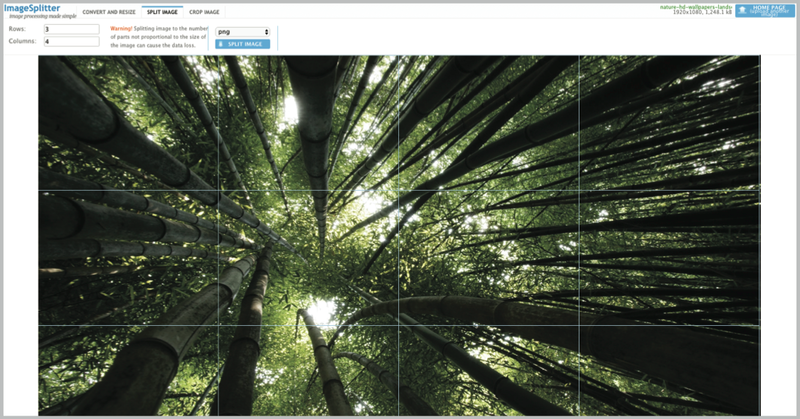 Once each image is imported, create a new project with the desired size of the individual tiles. In this example, the tiles are 3”x4”x.25”. Place the image pattern on the project board and resize it if necessary to fit all the way to the edges. Then change the depth to .18” and set bit optimization to best. If you are using Project Designer PRO and have the 1/32” bit, go under go to the edit menu and select “Board Settings”. 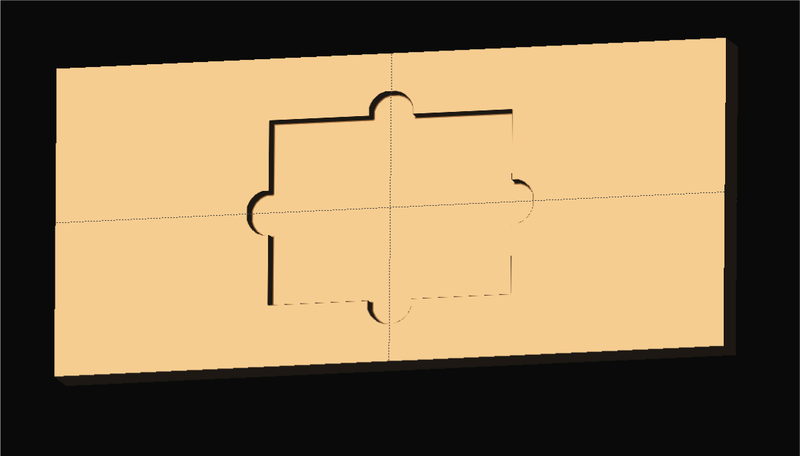 Click the Pattern Bit tab and change to 1/32” Carving Bit. This bit carves with much finer detail and is ideal for lithopanes. Save each tile with these same settings, and upload them to the memory card. 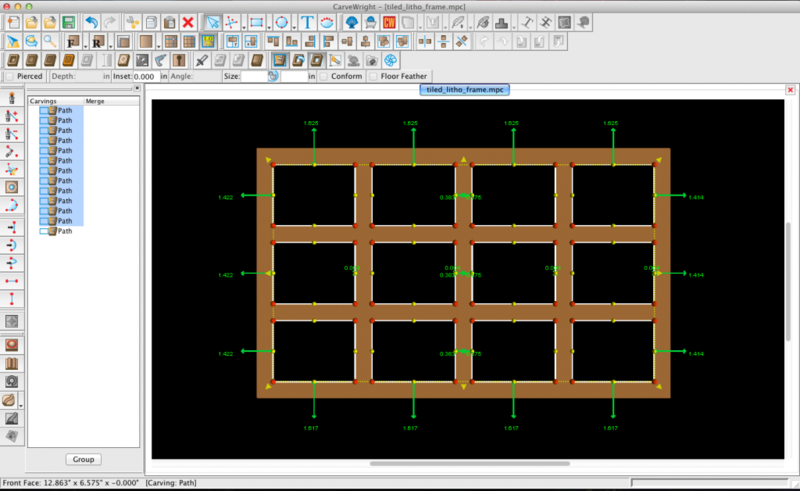 Design a jig for carving the lithopanes. I drew a rectangle the same size of litho pieces (3”x4”x.25”), and added some finger holes on the edges for easy removal of the finished pieces. I prefer double stick tape to hold the corian down and if needed use masking tape along the top edges. Then load it into the machine and carve them out one at a time. 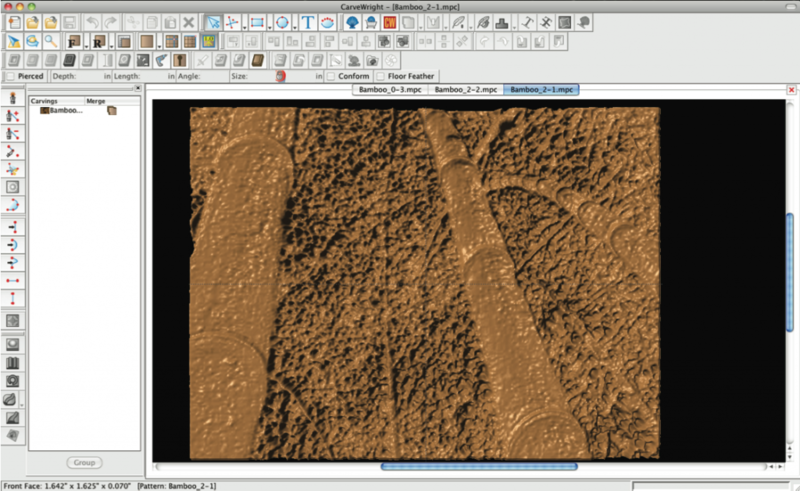 For more detailed lithopane carving instructions see our tutorial in the learning guide. Once your lithopanes are carved, you need a way to display them. What makes lithopanes so interesting is the effect from light passing through them. 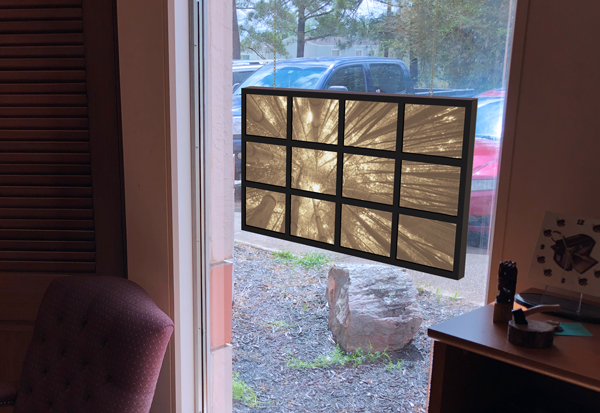 Building a box with a backlight is the most common way people do this, but I thought this project might look nice in a window using natural light. I designed a very simple 2 sided frame project. It has recesses carved into the back for the individual lithopanes to set into and then the frame openings cut-out from the front. Once everything is cut and mounted, it’s time to display it. I used brass chain to suspend the piece in the window. If you’d like to make this project or just study the files used to make it, please download the complete project below. This entry was published on March 29, 2018 / Joe Lovchik. Posted in The CarveWright Build Blog. Bookmark the permalink. Wow, someone must be reading my mind. I had planned on doing the exact thing over three years ago, but never got around to it. Great concept, I see that great minds do think alike. Nice project! Thank you for the great step-by-step too!